So, I recently experience life as a single working mother aunt while Baby Sister and her husband spent a week on a cruise ship. I only had her for four nights (I don't think my sister trusted me for any longer than that). I'm used to just taking care of myself - and then probably not that well - so having a 15-month-old added to the mix was quite the experience. I'm happy to report that she is alive and well, but that's about it. Baths...she may have only gotten one, on the day before her parents were due back. Feeding...she may have eaten a lot of Puffs, bread and crackers (she just wasn't into the green beans and carrots). Hair...major fail on this end. 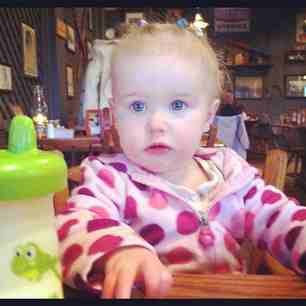 She has very fine blond hair and the ladies at daycare usually put it up in cute ponytails all over her head. 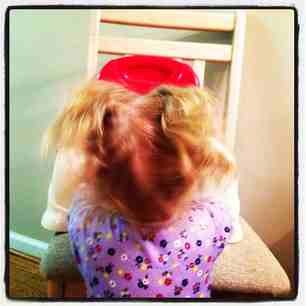 Here's a very grainy photo of what her hair looked like after daycare...should have gotten a shot of it from the back. 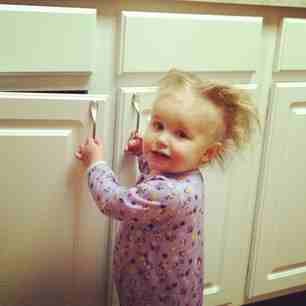 Unfortunately, I waited until right before bedtime to take them out so she went to bed looking like this and you can just imagine what her hair looked like the next morning! I'm pretty sure the ladies at daycare will have something to say to my sister about my stand-in parenting skills! She looks happy so who cares about dried boogers and bad hair. Heck, somedays I have dried boogers and bad hair myself!! Love Leah's comment! You did a great job! She's still alive and looks content so you did your job. You did what all great aunts let their nieces do: be herself! I'm sure she will be back for more very soon! Great job! 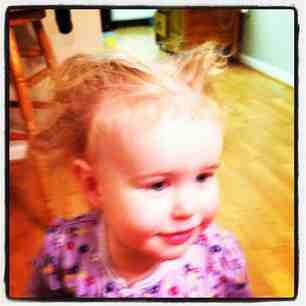 hahaha.. she is soooo cute!!!! I bet she had a great time, boogers and all!